Asagiri Heights, Japan, 1971. 23,758 campers from 87 countries. Theme: "For Understanding". Many and varied activities in a camp made colourful with the oriental decor set against the background of Mount Fuji. Perfect weather at the start and finish but Jamboree nº. 13 was typified by a typhoon in the middle. 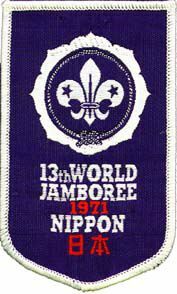 Owing to severe flooding in some sub-camps 16,000 Scouts had to be evacuated for 48 hours. Excellent emergency plans by the Japanese hosts and unforgettable hospitality by temporary hosts.